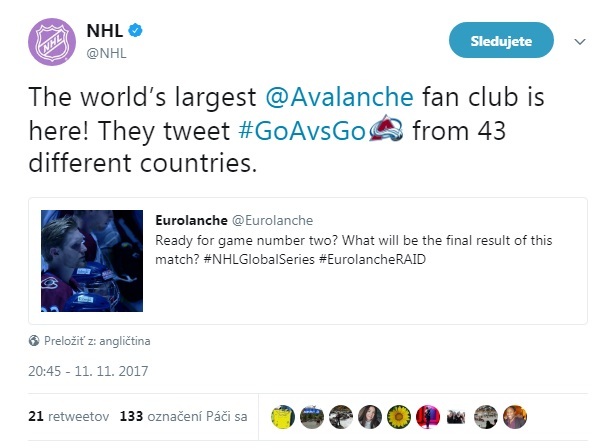 I wanted to present our members with the Avalanche merchandise or players signatures from the beginning, but finally it took some time when I could announce our first contest. We „receive“ or „gather“ souvenirs to our competitions in few ways: usually and most of the time I buy souvenirs in Denver for other members, and sometimes other executive staff members buy them too; sometimes we found a sponsor who donate us with them. Of course it is nothing big, like jerseys, hoodies or hockey sticks… But there were three examples when our members could win an Avalanche jersey. Firstly, I won the jersey in Denver, but because I have had already more than two, I donated it to our first big contest. Secondly and thirdly, we got a jersey thanks a sponsorship. One jersey was a part of the competition at our anniversary meeting, the other found its winner in Sweden at the Global Series event. Usually, our members can win pins, pens, hockey pucks, stickers… and players signatures! Since Invasion I I take many players photos for their signatures. Majority of them is for our members. It is really complicated to receive enough autographs. But I realize what it means to our members who never will visit Denver. Our most active members, mainly editors, receive souvenirs and autographs annually as their main benefit. Since the past summer, only Yeti Ultras group members can enter our general contest. Read more how you can join this group at this link.